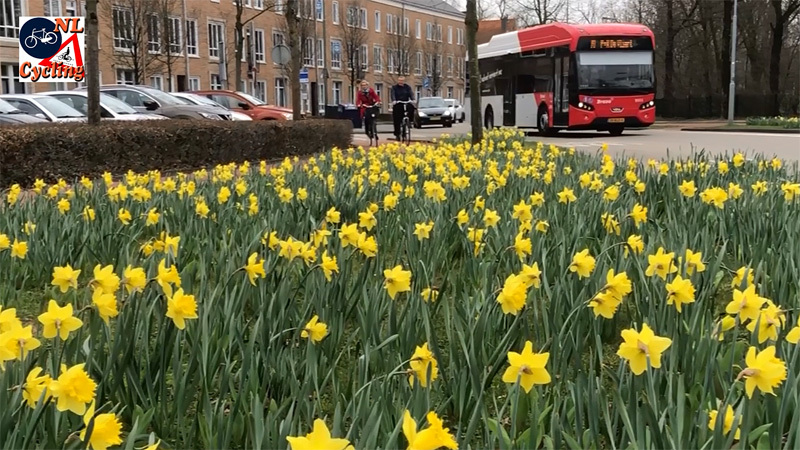 People were still ice skating earlier this month in the Netherlands, but now the first bulb flowers are in bloom! 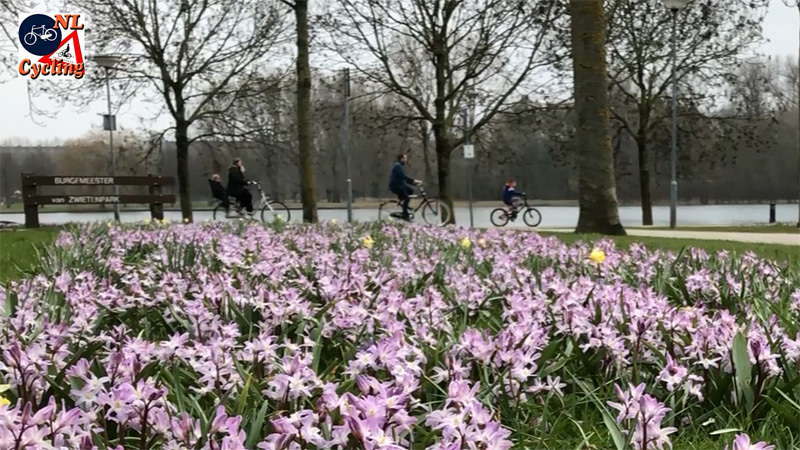 Many people went out cycling last Sunday to enjoy one of the first gentle spring days and to watch the first flowers of the season, crocuses and daffodils, that you can see blooming all over the Netherlands now. Purple and white crocuses in full bloom in ʼs-Hertogenbosch. Traffic islands in the Netherlands turn into flower beds every spring. Spring started on 20 March at 17:15 hrs and Daylight Saving Time on 25 March at 02:00 hrs. Although these markings are human inventions, things do begin to look very different from how our environment was in the winter. Recently, I stumbled upon a claim on the internet, that the many traffic islands in the Dutch towns and cities are wasted public space that should have been used for something meaningful to people. Those who believe this to be true should come to the Netherlands in spring time, when the bulb flowers are blooming. The flowers can be found exactly there, on those traffic islands. They do have a purpose besides protecting people. They turn the streets into a sea of colour. A welcome sight after the long grey winter. This protection strip between the carriageway and the cycleway is a sea of yellow daffodils. Purple crocuses along the streets of ʼs-Hertogenbosch. I have no idea what kind of flowers these little blue ones are. This mother had clearly been on a leisurely ride with her son. Great that you can do that in confidence on the safe Dutch cycling infrastructure. His father, her partner, cycled ahead of them. I’ve always connected bulb flowers with cycling, especially the early daffodils. That must be very personal and I think I know why this is. One of my early childhood memories is going with my parents to a nearby forest that had thousands of daffodils each spring. The bulbs had been planted in the 18th century park forest Bos Voordaan in 1933, as a job creation program during the Great Depression. 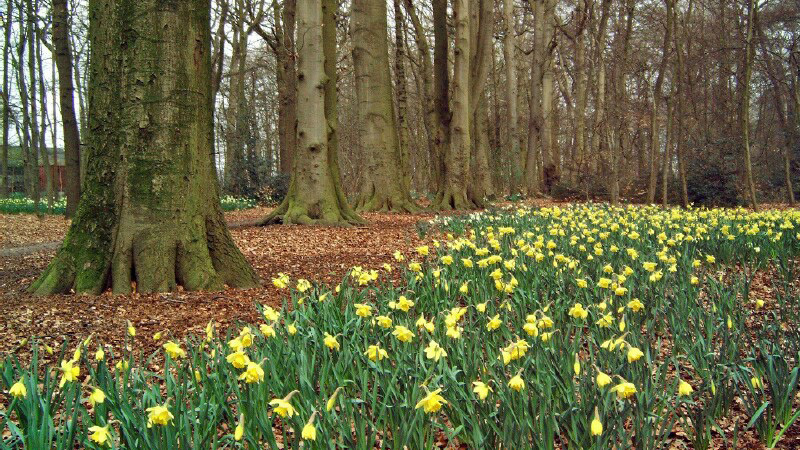 The flowers draw a lot of people from nearby Utrecht each spring, because even after 85 years there still are many daffodils in this tiny park forest. 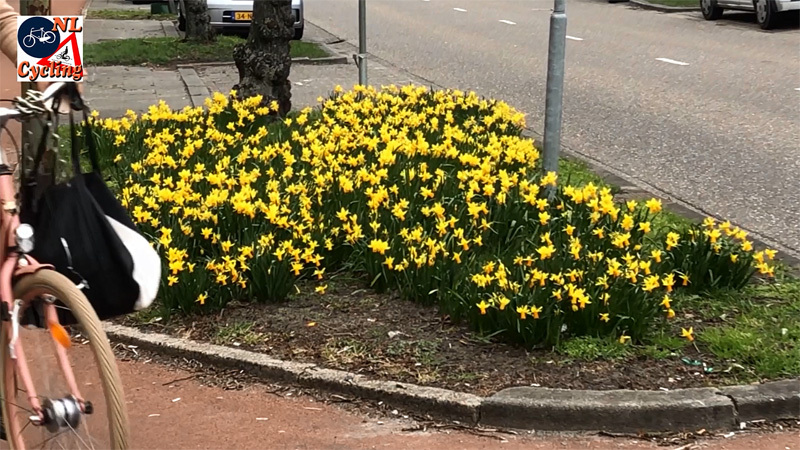 Daffodils cover all the protecting “dead” spaces of this roundabout in ʼs-Hertogenbosch. A father cycles past with a young child in the front seat. I have vivid memories of going to the Daffodil Forest in the children’s seat of one of my parents’ bicycles. One day we were all set to go when we heard a loud bang, just after my father had started to ride. This was followed by a loud hissing sound and a full stop. This exploding tyre made a big impression on little-me, which made me remember the event to this day. Or maybe it was the disappointment that we weren’t going to see the bright yellow fields of daffodils that day. Many parents cycled past the flowers with their children last sunday. Cycling makes you happy. 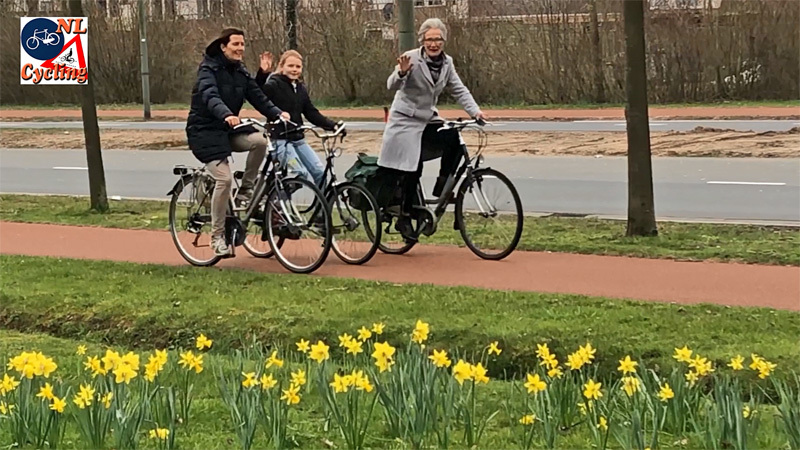 Friendly waving after these three ladies realised I was filming them, as they cycled past the daffodils. It seems we’re looking at three generations of women on their bicycles here. 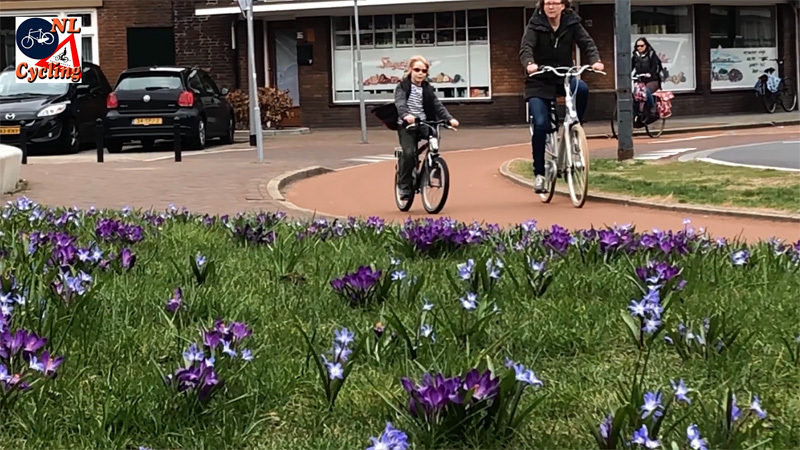 It may be no coincidence that this week’s video, which I filmed in ʼs-Hertogenbosch, shows a lot of parents cycling with children. 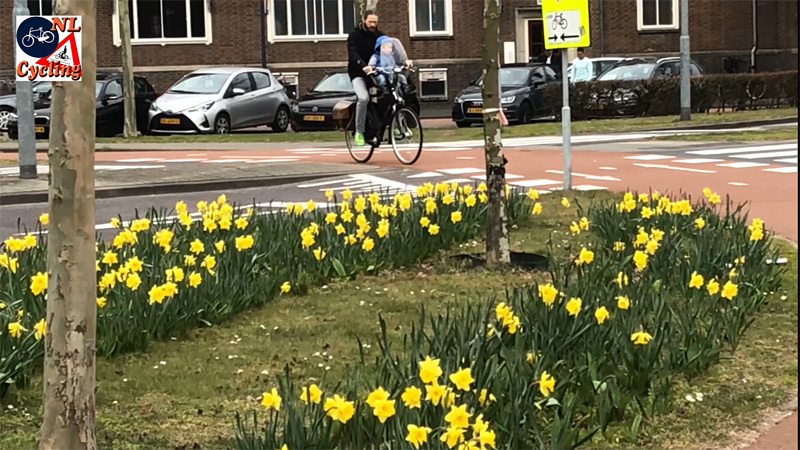 Showing your children the blooming flowers during a leisurely Sunday afternoon bicycle ride seems to be a favourite spring pastime of the Dutch and it has been like that for decades! 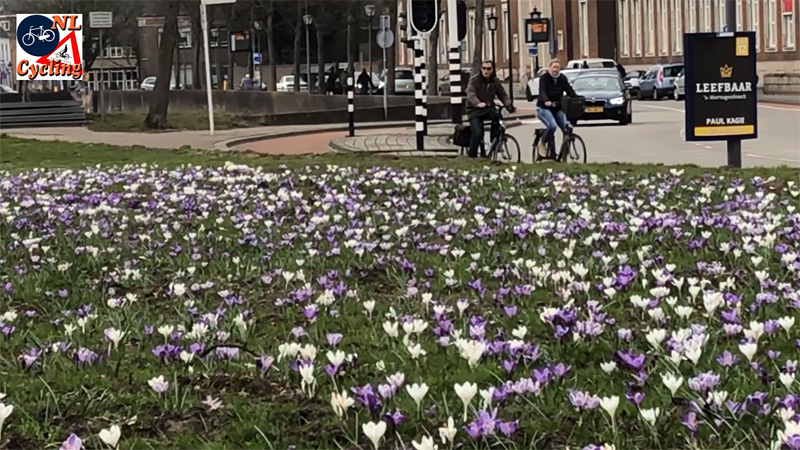 This week’s video: cycling past the spring flowers in ʼs-Hertogenbosch. I have learnt so much about (not just cycling but) photography from watching your videos. How to pan from static to moving subjects, zoom to focus on detail & reverse. It’s been an education. Thanks & keep them coming! The little blue flowers with white centers in the 4th picture are Chionodoxa Lucillae, sneeuwroem (Snow-fame or snow-praise) in Dutch. They’re small bulbs that you leave in the ground to multiply. The pink ones in picture 7 look like they might be the pink variant of those same Chionodoxa, which tends to grow a little bit taller than the blue version. The flowers look too upright and wide open for hyacinths. Very beautiful! Your springtime is running a little behind Atlanta. (Not surprising.) Those little blue flowers may be hyacinths? 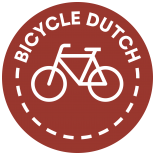 This entry was posted on 27 March 2018 by Bicycle Dutch in Original posts and tagged ’s-Hertogenbosch (Den Bosch), Spring, watching people cycling.